Along with setting a decent prune crop begins the important work of supporting current crop growth and canopy health and return bloom for future production. Adequate orchard nutrition is critical to both these goals. Special care in soil and nutrient management should be taken to maintain profitable crop development and canopy health. Saturated/wet, cold soils slow root activity. All nutrients absorbed from the soil are absorbed from the soil solution, so some soil moisture is necessary for nutrient uptake. But too much soil water interferes with nutrient uptake, as oxygen is rapidly depleted in saturated soil by plant root and microbe activity and “restocking” of soil oxygen from above ground atmosphere is blocked by water-filled soil pores. Wet soils are also slow to warm, and warmer soils mean warmer roots. Active biological processes move faster in warm compared to cool soils. Inputs of three essential mineral nutrients are needed in most prune orchards in most years – nitrogen (N), potassium (K) and zinc (Zn). In wet springs, tree N, K, and Zn availability may be limited by cold, saturated soils. Iron (Fe) and, occasionally, manganese (Mn) availability can also be limited under those conditions. Before getting into specifics about how this spring may impact N, K and Zn management, let’s review some basics regarding these key elements. Is primarily absorbed as nitrate (NO3-) by roots, but uptake also occurs as ammonium (NH4+). All N in fertilizer and/or organic matter inputs are eventually transformed to nitrate in warm, well aerated soils by microbes. Nitrate leaching with excessive soil moisture –rain or irrigation—as negatively charged nitrate is not held on the negatively charged soil. Ammonia volatilization from ammonium or urea fertilizer left on the soil surface and not incorporated with irrigation water or cultivation. Immobilization by soil microbes or weeds. Immobilization refers to the absorption and use of mineral N by microbes or weeds. Denitrification by soil organisms in saturated, low/no oxygen soil conditions. Nitrate is transformed into NxO and N2, that can’t be readily used by plants. Is most efficiently managed on a “feed the need” basis in most crops including prunes, as excess soil nitrate is readily lost by the mechanisms listed above. “The need” is made up of mostly crop and shoot growth as well as some storage in woody tissue in roots, trunk and branches. A dry ton of prunes contains 12-13 lbs. of N.
Is readily held on the cation exchange phase of soil, especially on the heavier soils commonly used to grow prunes in the Sacramento Valley. Foliar fertilization, only. Foliar applied potassium nitrate effectively replaced winter banded K fertilizer in a four year UC research project, but at least 4 to 5 sprays (20-25 lbs KNO3/acre for each spray) were applied from April to early August. Banded, soil applied K fertilizer is more slowly available to the tree than in-season fertigated K.
• Is required by a prune crop in the highest amount of any mineral nutrient – 23-25 lbs K2O/dry ton. Is tightly held on the cation exchange phase of soil, especially on the heavier soils commonly used to grow prunes in the Sacramento Valley. Is much less available to prune roots when soil pH is above 7 (soil is alkaline). Is required in relatively small amounts by a healthy prune orchard. An entire, mature prune orchard contained roughly 8 oz/acre in a UC study in Glenn County in the 1990’s. Is primarily needed in growing points of plants, so tree Zn requirement is highest at bloom when the largest number of growing points are present in prune trees (and other tree crops). Is commonly managed using a single foliar application, postharvest. Traditionally high Zn rates (20 lbs zinc sulfate/acre) applied at the beginning of natural leaf drop can be replaced by much lower rates (for example, 5 lbs zinc sulfate/acre) in early October although leaf drop will not occur with lower rates. 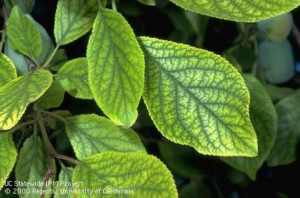 A spring foliar Zn spray can also effectively manage Zn in prune orchards. N and K are the most expensive nutrients to apply and the costliest to be deficient in a prune orchard. Since cropload drives N and K demand, thinning the crop — where needed — should reduce nutrient demand/acre while maximizing production of large, high value fruit. The first step is to count fruit just before the reference date is reached and thin, if needed, once reference date is reached. The more time that passes between reference date and thinning, the smaller the improvement in size of thinned compared to unthinned fruit. Delay first irrigation until 1) the soil will hold all the water applied by micro-irrigation or 2) the soil is depleted of 50% plant available water under flood irrigation conditions (see article on timing of first irrigation in this newsletter). If irrigation is applied too early and weather remains cool, tree water use is limited and the soil water content will remain high. Under saturated or near saturated conditions, root function is reduced and bicarbonate levels can build in the soil, reducing Fe availability and producing Fe deficiency symptoms (see picture below). This is a particular problem where irrigation water contains elevated levels of bicarbonate. Iron deficiency symptoms in French prune.